Endearing Romance! I loved the characters!! I loved the animals!! This story was so much fun! We meet Olivia Bennett on her 29th Birthday. After her night out celebrating, she is caught red-handed spray-painting the side of the building of a local chicken farm…sending a message about their mistreatment of animals. She is an Animal Activist on a mission! She is arrested, and spends the night in jail. Deputy Pete Sampson was the arresting officer, and he is very handsome. They crush on each other right away…their chemistry was electric. This is the story of their romance. I cannot tell you more, as you will enjoy the story more with this tid-bit of information. This is the beginning of a wonderful adventure between Olivia and Pete. Olivia’s passion for animals and their humane treatment is awe-inspiring. She is a force to be reckoned with…and, Pete knows this…yet, he cannot stop thinking about her. Olivia thinks of him often, too. Olivia was so sassy, with Pete being more reserved. I think this is what made them great for one another. 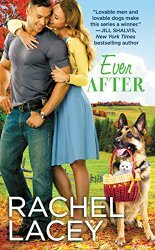 This story is told so well, with both their love for one another blossoming and their love of animals being front and center. They are both in a place where they are figuring out their next step in life. Pete rescues a dog….Olivia rescues a cat….Can they rescue one another? ?